The death of remarkable Australian mountaineer Lincoln Hall from mesothelioma last month, at the age of just 56, has brought back into sharp focus the deadly properties of asbestos. Hall was a man so tough that, in 2006, he survived a night without oxygen or shelter in the withering cold of an 8,700 metre slope on Mount Everest after his Sherpa guide had left him for dead — yet in the end he could not defy the the deadly fibres within his chest. Australians are well aware of the dangers caused by asbestos, especially as a result of campaigning journalist Matt Peacock, who exposed this toxic industry from the 1970s onwards. His unceasing efforts, and the efforts of campaigners such as the Asbestos Diseases Society of Australia and former asbestos workers, such as the late Bernie Banton, eventually resulted in a complete ban on the product in Australia in 1991. What Australians may not be aware of is that, largely because of a nation not dissimilar to Australia – Canada – this deadly industry continues around the world, and especially in developing nations such as India. Matt Peacock recently travelled to India and Canada to continue his campaigning journalism for the ABC, exposing Canada and its continued toxic trade in asbestos products in the third world, as well as the deadly epidemic of disease and death it is certain to cause. Asbestos is regarded as being the biggest industrial killer the world has ever seen, with a death toll calculated by the World Health Organisation at 107,000 a year, or about one person every 5 minutes. About 125 million people in the world are exposed to asbestos at the workplace. The International Labor Organisation estimates that the likely death toll from asbestos could ultimately reach 10 million people. The term “asbestos” refers to a set of six naturally occurring silicate minerals which all contain thin fibrous crystals which provide asbestos products of a heat resistant and durable nature. Its use dates back at least 4,500 years, to a time in which evidence shows an ancient Finnish tribe used asbestos material in earthenware pots and cooking utensils. The name itself comes from ancient Greek scholars from around the 3rd century BC — who referred to the material as “asbestinon”, which literally means “unquenchable”, as a result of the substance's fire resistant properties. Indeed, studies show the fibres in asbestos are stronger than steel and extremely resistant, which leads to both its desirable industrial qualities as well as its hazardous health impacts. These health impacts, indeed, have been observed since around the time of Roman scholar Pliny the Elder, who noticed that slaves working with asbestos cloth developed sicknesses in the lungs. Asbestos use has been recorded constantly throughout history in various parts of the world, although its use declined in the middle ages. Asbestos use did not become truly widespread again until it was popularised by Britain in the late 1800s during the industrial revolution. It began to be mined then in large amounts and a great many factories producing asbestos materials for industry and construction quickly began to spring up almost everywhere in the industrialised world. By 1900, though, researchers began to notice a large number of deaths and illnesses in asbestos mining towns, and studies in 1917 and 1918 showed asbestos workers were dying unnaturally young. The first diagnosis of the deadly lung disease asbestosis was made in the UK in 1924 and by the 1930’s, the UK regulated ventilation and made asbestosis an excusable work related disease; this was followed by the U.S. about ten years later. Despite this, asbestos use actually increased up until the 1970s, at which time it was being mined in 25 countries — with the world’s largest being the Jeffrey mine in the somewhat unimaginatively named town of Asbestos, Quebec. Use of asbestos began to decline as the adverse health effects – especially from mesothelioma, an otherwise rare form of cancer, along with the chronic inflammatory lung disease asbestosis – began to be well-known. There is no safe form of asbestos, according to the World Health Organisation; all forms – including white asbestos, or chrysotile – are carcinogenic and hazardous to human health. In Australia, it was largely through the work of ABC reporter Matt Peacock that the adverse health impacts of the then ubiquitous construction product, usually known as “fibro”, became well-known. Peacock’s investigations into the Australian construction products supplier James Hardie, and campaigning efforts by ADSA and former Hardie employees, such as the now deceased Bernie Banton, led to Governments in Australia regulating the product, before finally banning its production in Australia in 1991. In 2003, Australia banned the import, use and sale of products containing chrysotile, amosite and crocidolite. The asbestos industry battled ferociously against efforts at regulation, but in the end Hardie had no choice but to stop producing asbestos and to agree to provide the many thousands of victims, and their families, with what will eventually amount to billions of dollars in compensation. Peacock has written a book on this subject, Killer Company, which is soon to be made into an ABC miniseries. In a doleful footnote to the Australian asbestos era, public authorities are now working to remove asbestos from millions of Australian buildings — something that is also a severe and ever-present health danger. Canada has mined and exported more asbestos than other nation, and is the major stumbling block in the way of killing off trade around the world in this deadly material. In June 2011, for instance, efforts were yet again made to list chrysotile under the Rotterdam Convention on the Prior Informed Consent Procedure for Certain Hazardous Chemicals and Pesticides in International Trade — a multilateral United Nations protocol, usually known as simply the Rotterdam Convention. The Convention has 32 scientists from different nations on its expert body, which requires a consensus to list any products. Once again in 2011, at one of the Convention’s biannual meetings, Canada vetoed moves to list chrysotile. ‘Since the listing of chrysotile was defeated in 2008 … Canadian civil society has been mobilized and the hypocrisy of the Canadian Government's pro-asbestos position has been exposed. Canadian citizens are asking why is asbestos being taken out of the Canadian Parliament and the Prime Minister's residence, if it is safe enough to be exported to developing countries? Canadian doctors, public health experts, human rights activists and trade unionists have declared their support for the campaign to shut down asbestos mining and officially ban asbestos; although a de facto ban already exists whereby virtually no asbestos is used in Canada, there is no legislation prohibiting its use. ‘In light of the outrage expressed at home, the 2011 Canadian delegation to the Rotterdam Convention decided to let others do its dirty work. During the course of the plenary session debate on June 21, objections to listing chrysotile were expressed by 5 out of the 143 Parties to the Convention (3%); Canada stayed silent. The announcement on June 22 that India, one of the objectors, had reversed its position paved the way for productive negotiations with other dissenters. When it became clear that the asbestos veto was about to melt away, Canada – “the very silent elephant in the room” – emerged from the shadows. 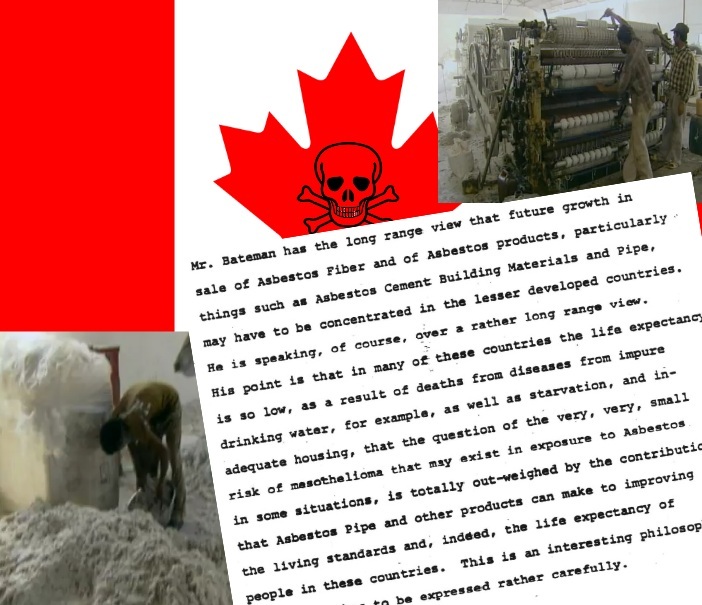 As Kazan-Allen says, while Canada continues to spend millions of dollars removing asbestos from its public buildings – including schools, the Canadian Parliament House and even the Prime Minister’s own residence – Canada continues to promote the trade of this toxic material to the developing world. What is unsafe for Canada is apparently perfectly fine for Indians. Canada has dominated the trade of asbestos over the last century and the asbestos industry is one of the key industries in the French-speaking province of Quebec. The right-wing Harper Government has poured millions into the Chrysotile Institute, which continues to promote the line that white asbestos is a safer form of asbestos. The conservative Canadian Prime Minister Stephen Harper is unapologetic about the continuing trade in asbestos, despite one of his own party’s MP’s, Chuck Strahl, suffering from asbestos induced mesothelioma. “Chrysotile specifically is permitted internationally under conditions of safe and controlled use. 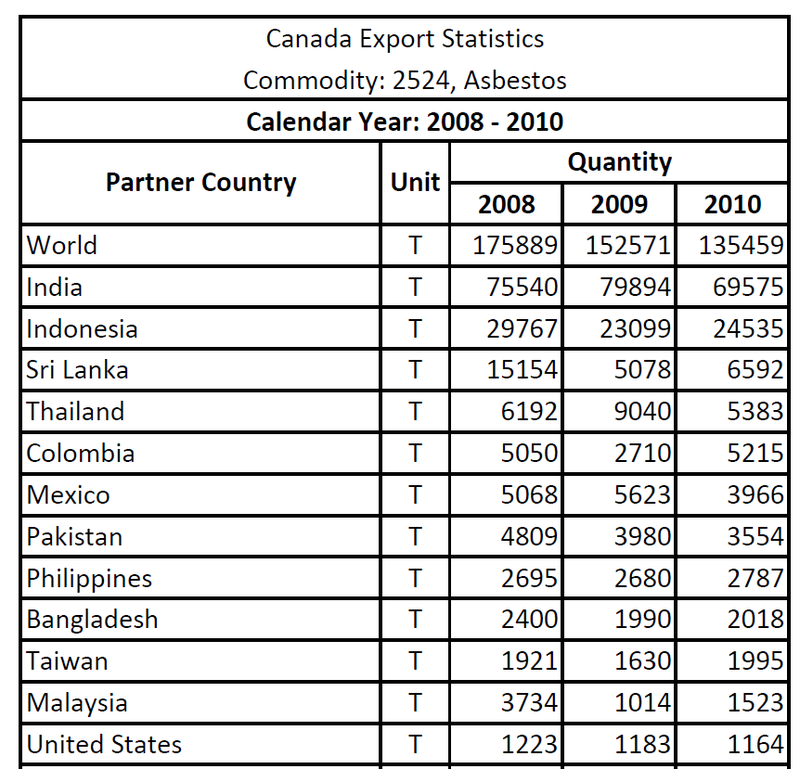 An analysis of Canada’s export trade from 2008 to 2010 shows that it exported about 463,919 tonnes of asbestos during this time — almost all of it to the developing world. 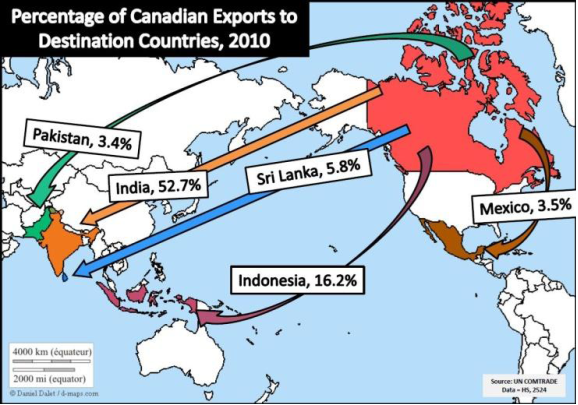 About half the trade – 225,009 tonnes, or 48.5% – was made to India, followed by Indonesia (77401t, 16.7%); Sri Lanka (26,824t, 5.8%) Thailand (20,615t, 4.4%) and Columbia (12,975t, 2.8%). In India, asbestos use is incredibly widespread, with scarcely a street or a village that does not have asbestos in its buildings. Backed by government concessions and subsidies, asbestos cement roofing is steadily displacing safer options like thatch, tiles or steel. India produces virtually no asbestos of its own and Canada has, for some time, been the primary exporter of asbestos to the Sub-Continent. The Canadian industry is currently going through a brief pause, with no operating mines in action since November last year. The Jeffrey Mine in Asbestos, Quebec, is desperately trying to acquire refinancing to reopen — although even with a CAD$58 million loan guarantee from the Canadian Government, it is still struggling to raise the private backing it needs to secure this finance. If mining does recommence at the Jeffrey Mine, Canadian production is set to triple, shoring up crucial independent parliamentary seats in Parliament for Stephen Harper in recession hit Quebec. The only other still functioning mine – the LAB Chrysotile mine in the town of Thetford Mines – has just run out of asbestos. The mayor of Thetford Mines, Luc Berthold, is cheerfully unconcerned about the risks to Indians from the export of a substance that is effectively banned in Canada. “If it’s used safely – if the workers in India respect the safety measures that we have put in place here concerning chrysotile fibres – then, yes, it’s a good product that offers many advantages,” said Berthold in his ABC interview with Matt Peacock. How India is meant to exceed safety standards that have never been met in any first world nation, including Canada, is not explained by the mayor. And despite his warm assurances, when a CBC documentary actually went inside an Indian factory, near Ahmedabad, just two years ago — they showed workers in a fog of carcinogenic dust, scooping up armfuls of raw asbestos fibre while wearing no protective clothing whatsoever. And an analysis of the pamphlets that accompany the material for sale in India show that they advise people in construction to saw the asbestos, without protection, advising customers that asbestos is perfectly safe. The caution notice on the pamphlet says “‘Caution - asbestos cement products present no known risk on health’. Unsurprisingly, experts predict a tsunami of asbestos related diseases in India in coming years. According to Indian environmental activist Madhumita Dutta, the Canadian double-standard in exporting a material they know will cause disease and death in the third-world, is simply a case of racism. “I think they are racist,” said Ms Dutta. “You know it’s such a double standard,” she said. Her assertions are supported by documents which clearly show that the asbestos industry has been pitching its product towards the developing world since the early 1970s, knowing – even back then – that its days were numbered in the industralised world. The minutes of the meeting of the international asbestos industry held in London in November 1971 provide a chilling insight into the lengths the industry will go to continue to profit from the deadly material. An account of the words of British asbestos multinational Turner & Newall’s Chairman, Alan Bateman, unearthed in the Turner archives in Manchester by Geoffrey Tweedle, co-author of a 2008 book on the asbestos industry’s fight for survival, show the industry knew about and accepted the risks of asbestos a full four decades ago, and were willing to sacrifice the lives of people in developing countries to continue the deadly trade. ‘Mr. Bateman has the long range view that future growth in sale of Asbestos Fiber and of Asbestos products, particularly things such as Asbestos Cement Building Materials and Pipe, may have to be concentrated in the lesser developed countries. ‘He is speaking, of course, over a rather long range view. 'The aggressive marketing of asbestos, a substance acknowledged to be a class-1 carcinogen, to industrialising countries is a classic example of the unacceptable face of global capitalism in the 21st century. More than fifty countries around the world have banned asbestos, many others have seriously restricted its use and even others just don’t buy it anymore because of the clear-cut evidence that exposure to asbestos causes fatal and debilitating diseases. For more information on the “asbestos tsunami” likely to hit India in future decades, as well as the extraordinary efforts via trade missions and diplomatic channels that Canada has gone to in an effort to shore up the Indian asbestos market, read Laurie Kazan-Allen’s 2011 piece ‘Asbestos Tsunami Headed for India’ by clicking here. As mentioned in the piece, Canadian production has ceased as the last operational mine has run out of asbestos. In order to resurrect the Canadian asbestos mining industry, the Quebec Government has promised a $58 million loan guarantee to a consortium of businessmen to finish work at a new underground asbestos facility at the Jeffrey Mine. This deal is dependent on the businessmen raising $25 million in private finance — a feat they have yet to accomplish. For more on the Canadian efforts to restart their industry click here. Find out more about asbestos at the IBan Secretariat website by clicking here.